California is one of the hottest destinations in America for foreign travel – and many choose the state’s cultural melting pot, San Francisco, to base their travels. The weather is usually breezy, but the city by the bay has a lot of great things going for it: it has a growing foodie scene, it is a great family holiday destination, and whether it is museums or nightlife, the culture here is unlike anywhere else. One of the hot spots in town is the Golden Gate Bridge, perhaps one of America’s most iconic pieces of architecture. Let’s explore this great spot – I’ve got some tips for where to get some great views as well. A bridge here on this part of the world is certainly an engineering feat – the area is plagued by strong winds and currents, heavy fogs, and water that has a very deep and uneven surface. The architectural details are Art Deco, and the famous colour is called International Orange – you may think it is unique, but other buildings and structures in the world use it because it is a colour designed to be easily identified in hazardous conditions, like the fog that plagues the bay. The bridge opened in 1937, under budget and had a week-long opening ceremony. You can drive across the bridge by car, of course – with no toll out of town and a toll coming into town. But I think the best Golden Gate experience is to cross by bike or on foot. I think it is actually a shorter walk than it looks, but you’ll want to dress appropriately because the winds certainly do whip through this channel in the bay, and the bridge actually is a bit of an arc, so be prepared for a workout. Marin Headlands: Across the bridge from San Francisco is Marin County, and right off the bridge is a park called the Marin Headlands. It’s where a lot of military artillery lays in ruin, build during WWII in expectation that an invasion was imminent. Today you can hike around and get some fantastic views of the bridge. On the Bridge Itself: Like I mentioned above, the best Golden Gate experience is walking it. Great photos too. Especially if there is fog. Land’s End: On my recent trip I found out about this spot, which is on the San Francisco side but past the bridge towards the sea. You can walk along the trails here to get vantage points of the bridge from a new perspective. Very cool. Lastly, I will close by saying this: prepare for disappointment. The bridge is often in fog. I have been to San Fran a number of times, and days with a crystal clear view are infrequent. But still, go check it out – it’s a great experience. 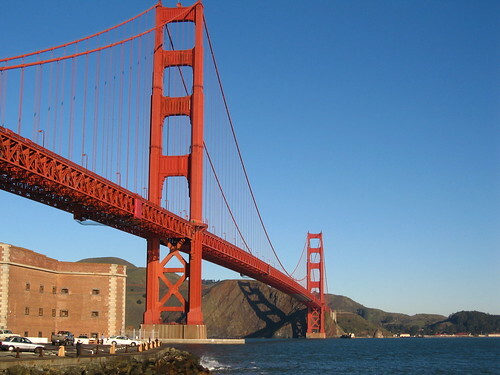 Do you have a Golden Gate bridge travel tip?